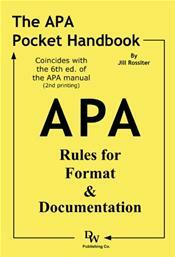 This handbook is ideal for preparing undergraduate essays. It was specifically designed with the average student's needs in mind. The book is intended to cover the vast majority of situations that the normal student will encounter while writing a college essay. Organized for speed and brevity, the book is primarily a concentrated, up-to-date guide on APA format (11 pages) and documentation requirements (12 pages In-Text, 19 pages References) with a heavy emphasis on examples and visual aids (90 to be exact). Additionally the book contains pointers on how to get started, what to document, what notes to take (by source type), and how to handle quotes of varying length. All of this in a book designed to fit in a shirt pocket. Product Dimensions: 60 Pages - 5 5/16" x 3 3/4" x .166 " Continuously Updated - Coincides with most recent APA standards (APA Manual 6th Edition) Last Update 6/2/10.